Was born in 1978 in Ljubljana (Slovenia), where he graduated in the clarinet from the Academy of Music in the class of Slavko Gori&ccaron;ar before concluding his postgraduate studies with distinction and obtaining his master's degree in solo performance under renowned clarinetist and teacher François Benda at the Basle Academy of Music in 2004. He continued with further studies in masterclasses (clarinet, chamber music) conducted by eminent musicians (A. Carbonare, T. Demenga, A. Vardi, M. Kliegel, F. Hermann, H. Beyerle). He has won a number of awards at various competitions, prominent among them being first prizes in the categories of chamber music and clarinet at the Slovenian National Competition for Young Musicians in 2000 and 2001, as well as the first prize in the category of solo clarinet at the Marco Fiorindo International Competition in the Italian city of Turin in 2002. Mr. Kenig has also received the Prešern Award of Ljubljana University for special achievement in music. He has given successful performances in Slovenia and abroad as a soloist and chamber musician playing with Adriars Trio and Artvento Wind Quintet. A list of countries where he played includes Slovenia, Austria, Italy, Germany, France, Switzerland, India, Croatia, and others. He has played with the Slovenian Philharmonic, Basle Symphony Orchestra, Bratislava Chamber Orchestra, Orchestra of the Slovenian National Theatre in Ljubljana, Ensemble Cantus under the batons of renowned conductors, such as Marko Letonja, Stefan Sanderling, Othmar Maga, Loris Voltolini, Berislav Šipuš... He was involved in projects of contemporary composers such as Krzysztof Penderecki, Heinz Holliger, Jürg Henneberger, Jürg Wyttenbach, ... His brilliant and skillful performances have inspired a number of Slovenian composers to dedicate their compositions to him. Critics praised his performances of Thea Musgrave and Pierre Boulez's compositions given at a recital opening the 24th Music Biennale Zagreb, an international festival of contemporary music, in April 2007 and at the Electromediaworks festival in Athens in May 2008. His first integral performance of all the compositions released on CD, published by Cantus, d.o.o., was given to both a public and critical brilliant acclaim at a concert in early July last year at the Great Hall of the Slovenian Philharmonic. 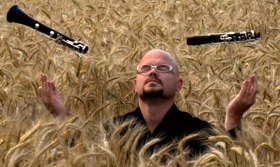 With his woodwind quintet Artvento he released a CD "Molly Brallghan" at the German label Woopee records. He is a guest lecturer at the Ljubljana (Slovenia) Academy of music. In November 2008 he had concerts and workshops in Ljubljana (Akademija za glasbo, Slovenia), Berlin (UDK), Basel (Musikakademie der Stadt Basel) and in Lugano (Conservatorio Della Svizzera Italiana).